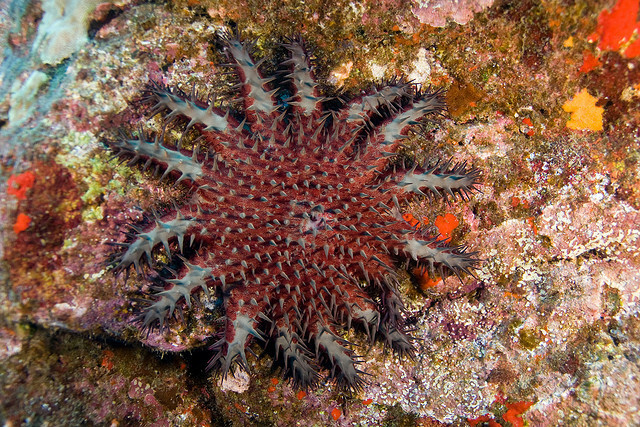 Outbreaks of crown of thorns sea star (Acanthaster planci)–see Figure 1, are one of the main causes of coral reef decline in the Indo-Pacific, including Australia’s Great Barrier Reef. Due to their voracious appetites and few predators, crown of thorns sea star, or COTS for short, can decimate large areas of live coral in a short period of time. Great efforts and resources are directed at reducing population outbreaks. However, given a limited understanding of why, when and where outbreaks occur, the most direct solution is to take ‘em out (not to a nice dinner, but to kill them). Death by injection of sodium bisulfate is the most commonly used method, but this requires COTS to be removed from the reef and injected many times. Bile is a digestive liquid that is stored in the gallbladder of all vertebrates and can be collected from cows and sheep after they are slaughtered for the meat industry. Derivatives of bile such as oxgall (dehydrated bile) and Bile Salts No.3 (more refined) have been tested as an alternative substance to kill COTS in the Phillipines with promising results. In the Great Barrier Reef, COTS can reach huge, honkin’ sizes, up to 42 cm (16.5 in) in diameter! Rivera-Posada et al., wanted to assess the effectiveness of bile-derived injections in the Great Barrier Reef and hence, as a potential widespread control. After all, being able to kill COTS in situ would be less labour intensive than lugging them out of the water, killing and disposing of them properly. 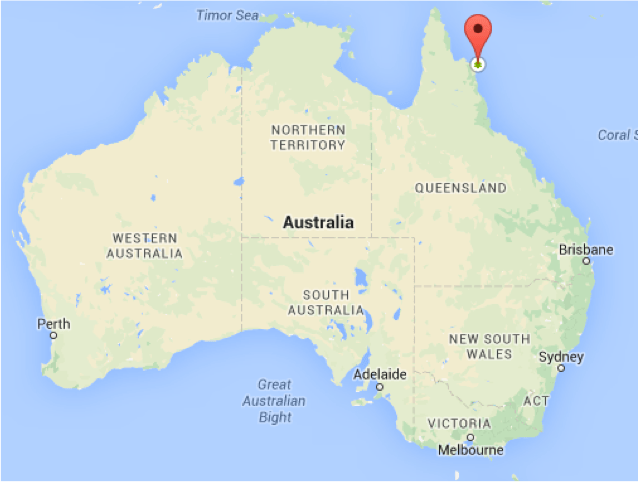 Figure 2: The location of Lizard Island is marked by the red bubble. 220 COTS ranging from 30-42cm (12-156.5 in) in diameter were collected around Lizard Island in the Great Barrier Reef—see Figure 2. The captured COTS were then transferred to tanks at the Lizard Island Research Station and acclimated. Different concentrations of oxgall (6 and 12 grams per litre (g/l)) and Bile Salts No.3 (4 and 8 g/l) were mixed with distilled water. Distilled water was used because bacteria in tap or seawater may break down the bile rendering the solution less effective. Ten groups of five COTS were then injected with different concentrations of both oxgall and Bile Salts No.3 solutions in different sites of the body—See Figure 3. Other marine life such as fish, corals and echinoderms were then collected and acclimated to assess any potential side effects of using the bile derivatives. Collected animals were placed in a control tank, or in the same tanks of injected COTS for 8 days. Another injected COTS individual was placed in the treatment tanks on the fourth day. Activities of all animals were recorded on video. Figure 3: Left – Injection sites tested, Right – Injection guns tested. Taken from Rivera-Posada et al., 2014. In the field, outbreak conditions of COTS were mimicked by placing 50 collected COTS each in two neighbouring, small patches of reefs. One hour of acclimation was given to the COTS, then divers were unleashed to administer a single 10 ml, 8 g/l injection of Bile Salts No.3 with the prototype gun at one reef. At the other reef, divers administered six to fifteen 10ml, 140g/l injections of sodium bisulfate with the DuPont Velpar Spotgun (commonly used method), see Figure 3. Activity of injected COTS and surrounding marine life were recorded with strategically situated cameras and analyzed–See Figure 4. Figure 4: B – diver injecting COTS during field studies. C: In-situ GoPro recording species interactions with COTS remains. Taken from Rivera-Posada et al., 2014. Data from all parts of the study were then statistically tested for significant results. 100% of the COTS that were administered the Bile Salts No.3 (refined bile) died, significantly higher than the 80% mortality rate of COTS that were injected with the oxgall (dehydrated bile)–See Figure 5. The Bile Salts No.3 possesses sodium cholate and sodium deoxycholate that are known substances that cause cell membranes to rupture, so this result was not surprising. Doubling the concentration of both bile solutions decreased time between injection and death. Furthermore, it was found that the base of the arm was the most effective injection site since it had the shortest time to death after injection–See Figure 5. Figure 6: Wrasse picking at COTS remains in the field. Reef fish, coral and echinoderms that were exposed to injected COTS did not show any signs of illness, even after some completely consumed COTS remains. It is likely that naturally occurring marine bacteria break down Bile Salts No.3, so that less is consumed by fish. In the field, since only one injection was required with Bile Salts No. 3, it took around 12 minutes for divers to inject all found COTS, substantially less time than the 35 minutes it took to inject all COTS multiple times with the sodium bisulfate solution. One advantage of using the traditional bisulfate method was that it was obvious if the COTS had been properly injected as the COTS became immobile immediately. COTS that were injected with Bile Salts No.3 were hyperactive for up to one hour. Interestingly, predation by pufferfishes and triggerfishes was common on COTS injected with sodium bisulfate, yet there was no direct consumption by the same fish on COTS injected with Bile Salts No.3, although other fish did pick at the remains—see Figure 6. Overall, Bile Salts No.3 is a more efficient and effective substance to elicit COTS mortality in the Great Barrier Reef. Less of this solution is needed, and time to death after injection is shorter than other chemicals. While this is a great step, Bile Salts No.3 still require treatment of individual COTS. During an outbreak, COTS can reach densities of up to 156,000 per hectare, so it is time consuming, very expensive and not feasible for large areas. Thus, the importance of developing new and more effective control methods remains a top priority. Rivera-Posada was able to classify the entire microbiome of COTS comparing healthy vs sick COTS last year. The results from this mapping were 25 potential candidates to induce a COTS-specific disease. Unfortunately funding is limited for continuing studies, so if there are any interested grad students or marine biologists reading this, get involved! In the meantime, Bile Salts No.3 provides a great alternative to the current widespread method. And when used in conjunction with management efforts to reduce nutrient influx, and supporting successful protected areas to bolster COTS predator populations, we can cheer on corals in their fight for survival!